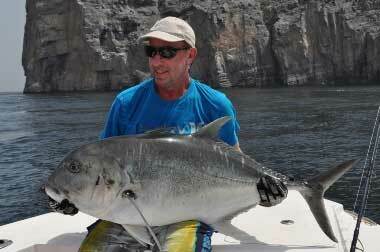 Back in April 2008 two friends and I planned out a trip to fish for the notoriously hard fighting Caranx Ignoblis, more commonly known to anglers as the Giant Trevally this is a fish that is arguably one of the hardest and toughest you are likely to battle on rod and line. The GT can grow to an impressive size with the all tackle world record currently standing at something just over 160lb caught off Japan in 2006 and Divers have often spoken of seeing fish exceeding this size. While we were not setting out to break any records we did want to fish somewhere that had a reputation for some of the larger size fish. 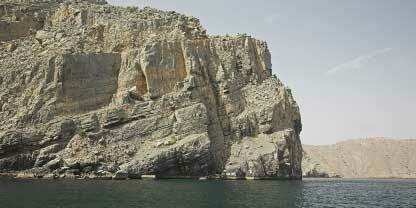 One such place that caught our imagination was the Musandam area of Oman. Easily accessible from Dubai the Musandam Peninsular is an exclave of Oman than juts into the Strait of Hormuz and is separated from the rest of Oman by the United Arab Emirates. This is a mountainous region that more commonly attracts tourism via Dhow excursions that offer some spectacular scenery as well as an abundance of wildlife that include some impressive Coral Reefs that are perfect for Divers. The trip went ahead and resulted in some personal best fish for all three of us as we all caught GT over 30kg with my largest just reaching 40kg so when more recently another friend Andy Matthews mentioned that he had to visit Dubai for a few days to work and asked if I knew of any fishing in this area I jumped at the chance to tag along and once again fish the Musandam. I was soon back in touch with the guys at www.oceanactive.com who had arranged our trip previously and they were just as obliging this time organising three days of fishing for us. The fishing is aboard long centre console boats that easily fish three anglers so we were joined John “Chalkie” White which also conveniently reduced the individual costs. A direct evening flight from Gatwick saw us land at Dubai at 8am where we met our driver Raul who was to take us two hours north across the border and on to the town of Dibba where we were staying at Ocean Actives own Villa aptly named “GT House”. On the way we had arranged a short visit to their Tackle Shop in Dubai to meet Jon Viney who had helped with some of our arrangements and to get a fishing update as well as maybe top up on any fishing gear that we may have needed. It was good news all round as the recent fishing had been very good and the weather forecast was also favourable at least for the first two days anyway. The previous day there were seven GT caught with a number of fish over 30kgs and a few days prior their two boats had managed 17 fish between them using poppers, stick baits and jigs with a further 8 raised, our hopes were high. We arrived GT House where we could relax in the sunshine with a cool drink and awaited the return of three anglers who had been out fishing. 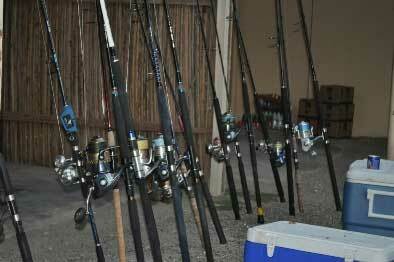 Again it was good news with eight fish caught on one boat; six were over 20kgs the largest being close to 40kgs. After an amazing Steak and Kebab Lunch cooked on the Barbeque we spent the rest of the evening sorting our Rods for our first days fishing tying and checking knots and leaders with the able assistance of ”LB” who was to be our guide for the next three days. We had brought most of our own gear but the beauty of fishing with Ocean Active is that they will supply any tackle you may require on a “pay if you lose or break” basis. Alarms were set for 4.30am as we needed to be ready and on the water for 5.15am so after a quick breakfast we loaded our gear into the pickup and we were off to Dibba marina just a 5minute drive away. Once everything was loaded onto our boat we were away, joined by the second boat that had two French Anglers aboard who had fished the previous day. The main fishing areas are around 80kilometres to the north which is some distance but these boats were cruising at 30 knots plus and after one and a half hours we had arrived. It was a very misty morning and the sun was still rising, as we entered a sheltered bay we could see shoals of small Long Fin Tuna smashing bait all around us and the temptation to grab the light spinning gear was just too much, I had to cast towards them. It was soon apparent that the bait fish they were chasing were very small as despite a fast retrieve I had no takes on my 28g jigs so I changed to the smaller 18g to try and imitate the prey. Before I could cast again we were quickly moving as LB had spotted some GTs crashing through bait around a rocky corner so the stick baits were soon in the water in a hope to connect to one of them. We made two drifts without any success but they were gone, and as soon we spotted some Dolphins that had moved into the area it was time for us to move on as well. The Musandams rugged coastline is shaped by the earth’s movement where the Arabian Plate is pushing up under the Eurasian Plate and part of the peninsular is actually sinking. While the higher mountains and a few of the larger rock peaks remain above sea level the sea has filled the lower valleys dispersing the running tide creating some wild water and strong currents at different states of the tide so it’s very much a case of relying on local knowledge to put you in the right area at the right time, GTs love to chase baitfish into the current where they get disoriented and become easy prey. Because of this we found that we were constantly on the move searching for the tide rips and we had tried three or four more areas before arriving at the “Lions Jaw Gate”, so called because the rock face does resemble a Lions Head, Mane included. By now I had changed to a Popper to vary our chances and on our first drift I raised a group of GTs that followed and snatched at the popper three times without me hooking up, very frustrating. After two more drifts we had a couple more follow ups but still no takers so we moved again to a rocky point opposite the Jaw and on my second cast I finally hooked up. You need to have your reels drag set hard as the first thing a GT wants to do is take you straight back to where he came from and strong leaders and braid are no match against the jagged reef below, the end result is obvious if you can’t hold the fish while the boat is used to assist you into slightly deeper water to improve your chances of getting the fish to the boat. This puts a lot of strain on your tackle (and your back) but once you are away from the reef in the relative safety of deeper water you can start to enjoy the fight and what a fight! We boated the fish and I couldn’t believe how small it looked following the struggle Id just endured. 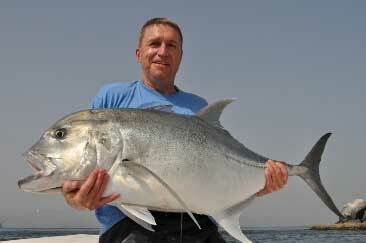 It measured 97cm from head to the fork of the tail and a quick calculation put the fish at 17.8kgs, just over 39lb. A few quick pictures and the fish was returned to fight another day. As the tide had slackened LB took us to open water to try some jigging where I managed to catch a small Emperor Snapper before we decided to call it a day. On the way home we tried one or two of the ripping currents and as I brought my popper almost to the boat I noticed a bright flash below when suddenly it was hit by a large King Mackerel right in front of my eyes, it exploded on the surface and out of the water and still the fish never got hooked. Next we heard another splash behind us and I turned around just in time to see a Sailfish leap clear of the water just twenty feet from the boat, I tried to tempt it with the popper as it swam straight under the boat below my feet but I couldn’t get it interested. 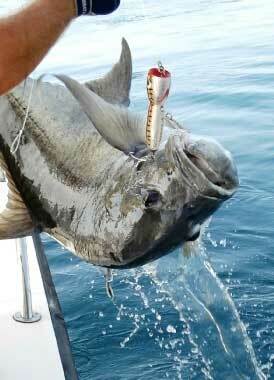 On the last mark we tried I again raised a good GT without hooking up before we finally left for home. As we arrived at the dock we could see that the two French Anglers had also just returned so I asked how their day had been compared to our one of frustration and our luck couldn’t have been more different. They had fished the same areas with the same techniques just at different times of the day yet they had successfully managed to catch another seven GTs to 37kgs with three fish over 30kgs.That was their last day fishing so we had the water to ourselves for the rest if the trip. That evening we settled down at the villa to a home cooked Srilankan Curry which was excellent then it was an early night as we were to leave even earlier the following morning. At 5am we were already making haste towards the fishing grounds in an attempt to catch the outgoing tide rips but the first three or four marks were non productive. We fished areas that were alive with other fish such as Fusiliers or “GTs Sweeties” as they are known, sizeable Milk Fish that are definitely not going to be interested in our poppers and many Garfish before LB took us to “Popper Rock” an area that was successful for me on my previous trip. 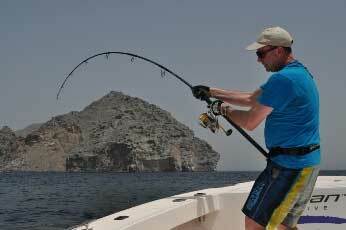 Sure enough on our first drift Andy’s 150g Wahoo Stick Bait was smashed by a GT and after some clever boat manoeuvres he had fought the fish to the boat. This was Andy’s first GT which at 112cm calculated out at 27.35kgs, just over 60lbs, and a cracking fish that was quickly returned. On our second drift both Chalkie and I watched in amazement as a huge GT came up and hit my popper smashing it from the side just a few metres from the boat and I was locked solid as it made its way to escape. LB again manoeuvred the boat in an attempt to pressure the fish away from the reef as I held on but there was no stopping the fish which still managed to scream line from my Stella 18000, as I held on best I could the inevitable happened as my braid made contact with the reef....All Over!! The power of these fish never ceases to amaze me how they seem to strip line from the spool with ease when you can hardly pull off any line by hand, the drag is that tight. This would have clearly been the largest fish of the trip had I managed to land it. We tried two more drifts as the currents had now changed so we again went off to try some jigging. I was quickly into what I believe was a better size Snapper as this came off just before the boat and Andy also hooked a sizeable fish which in turn bit through his Assist Hook so it was down to me to land the only fish, a small barracuda. After some lunch we returned to drift the Lions Jaw and as we did, Andy spotted a number of large fish crashing into baitfish on the opposite side where I had caught the day before. Lines retrieved we quickly made our way over to investigate when fish suddenly started crashing behind the boat. Soon we experienced a Mini Blitz of action as large Tuna were scattering Bonito all around us and some good size GT were joining the action. I cast off the back of the boat where fish were jumping, quickly brought in the slack line to start working the popper as everything went tight and I was into a fish straight away. The current was strong at the time and line was screaming from the spool as I tried to gain control, it was only after a fairly long run that the fish slowed down and LB suggested I was into a GT. Because of the reef it is not wise for someone else to try and hook up while a fish is already being fought which was a shame as there were still a few fish crashing around us but this fish wasn’t giving in. Whether the fish was hyped up with all these baitfish around or whether it was just using the current which made the fight harder it took me a little longer to get it to the boat and I really thought I was into one of the bigger fish. Once onto the boat the fish measured at 109cm giving me 25.22kgs or 55.5lbs, still a nice GT though I was again convinced it would have been larger. We tried a couple more drifts as the odd fish were still crashing through the Bonito but they soon disappeared as quickly as they had appeared. We tried a couple more areas without any interest as we made our way back to the dock then it was home for some excellent chicken Kebabs and roast vegetables in the evening. Our last day and the weather forecast was for 11 to 20 knots of wind so we wondered if we might have to cut our time short,we were pleasantly surprised to find the sea calm and the wind never picked up. On our second mark I was working my popper as a Mackerel picked it up jumping some four feet into the air before throwing it away. We tried a number of areas including Popper Rock but we just couldn’t raise a fish so LB decided to take us to a shallow reef out in open water named as “military Base”. “Sometimes the fish are here and sometimes they are not” LB informed us as something chasing Andy’s Stick bait caused a big splash near the boat, “I guess today they are here”. We managed to at least raise a few more fish though not hooking up before deciding to have a try at some light tackle fishing around “Bird Island”. Using a 45g Bite Me Jig Chalkie had no sooner cast when he was into a fish that turned out to be a smaller GT of around 3kgs, great fun on the much lighter tackle. We had lunch as the tide was turning then returned to try the Lions Jaw and the opposite side where Chalkie had a nice size GT smash his stick bait right at the boat; the fish then moved its attention onto Andy’s lure before swimming away. It was time to call it a day and on the way back LB took us via deeper water in the hope we may get some final Tuna action or maybe Dorado but by now we were just content to laze on our comfortable bean bags courtesy of Ocean Active. As I mentioned earlier the Musandam has been created by the movement of tectonic plates that have been responsible for much earthquake activity in Iran over the years and on our way home LB received a phone call to say that the effects of such activity had just been felt at the Villa shaking the chandeliers. It turned out to be an earthquake that had occurred near the border between Iran and Pakistan and measured 7.8 on the Richter scale. We were lucky not to have felt anything out at sea and were totally oblivious of the facts but 40 people had been killed and 300 injured. I assume also that the peninsular had sunk a bit further. 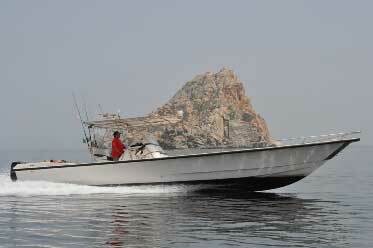 Overall the fishing had been hard but we had seen enough activity to make us want to return again. The weather was fantastic and the staff and all concerned with Ocean Active had been superb so our thanks go out to you guys and we hope to be back next year.